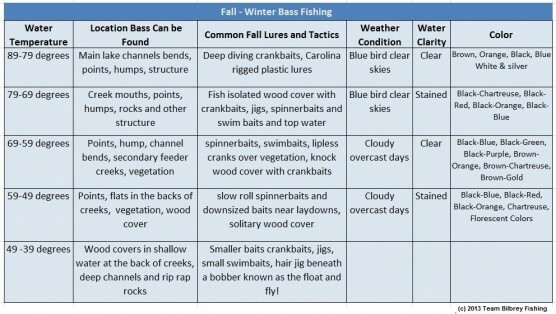 As fall starts to show its presence across the country, the lakes will soon bean to transition, as the leaves start changing colors, anglers should give some thought to the changing conditions when selecting the lures and colors as well. 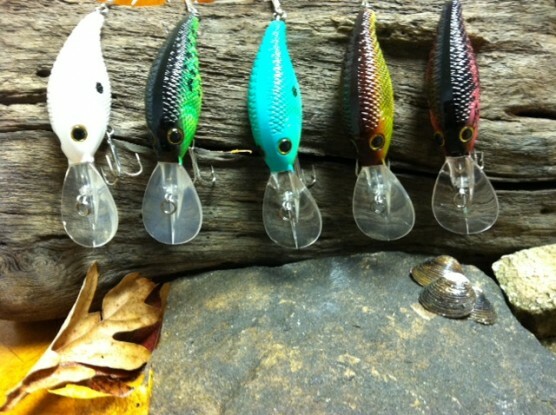 It can be difficult to decide the correct color of lure to use this time of year. Anglers must consider the water clarity and the type of forage the bass are feeding on and how the time of day affects the brightness of sky to choose a lure color. However as the smaller lakes will soon be beginning the turn over you will see clear water, clouded water and muddy to dark water all in the same lake on the same day. Even aquatic vegetation will begin to change colors in the fall due to temperature and the amount of sunlight and water clarity. In this season of change anglers sometimes are at odds as to what to throw, and with so many different changes and so many different lures, it would be impossible to stock all the colors and lures now available into one tackle box. After the spawn in the spring bass are feeding on shad, small bream, perch and bluegill, making lures colored in greens, blues and other natural colors that resemble these fish more effective in specific lakes with clear water. In dark or muddy water bright colors such as chartreuse, yellow and orange seem to get the attention of bass better than other colors. One thing that lure manufactures have long over looked is that beneath the waters surface fish see colors differently than we do with the human eye does in the air. The color a bass will see is depending on depth (and clarity) due to a prism effect as light (or heat energy) is absorbed by the water. This is why black is a productive color on any given day and in many conditions and depth. Black is last color lost in low light, and the color that all other colors appear to be in deeper water with less light (or heat energy). Red is the first to go followed by the colors of the rainbow, yellow, orange, green, blue, and violate until all fade to black. Now that fall has arrived, soon the bass will be schooling and starting to chase bait fish into the shallow creeks, and in shallow clear water, matching the bait in color with a lure is always the best choice. Hours of research and time on the water with trial and error, has proven to anglers that there are no set "rules" in selecting color of lure to fish. As the bass hold at different depths, their perception of color changes, and trying to compensate this natural illusion with color changes to turn the head of a bass can be difficult. Confidence can be the most important factor in what works, and certain baits and colors give anglers that needed confidence. I recommend that anglers follow trusted guidelines like I have mentioned in this blog and experiment with different colors and combinations to discover which ones work best on their home waters during this time of transition. It is the best practice to buy and keep on hand a few basic colors than it is to buy every color on the market, until you have fine-tuned the waters you fish to the season you are fishing. I have learned when Mother Nature changes the colors of the leaves I have to change the color of my lures I use.